In high school, I was lucky enough to have babysitting jobs because I had a younger sister. The plan of attack was simple : she made friends, I met her friends (and their parents), and they asked me (sometimes) to babysit because I was (naturally) the older and more mature sibling. In reality, I couldn’t have been more thrilled to hang out with my sisters’ friends, as they are all charming with charming younger siblings themselves. Eventually, our families would just merge and become friends. It is from such a friendship that this recipe surfaced. 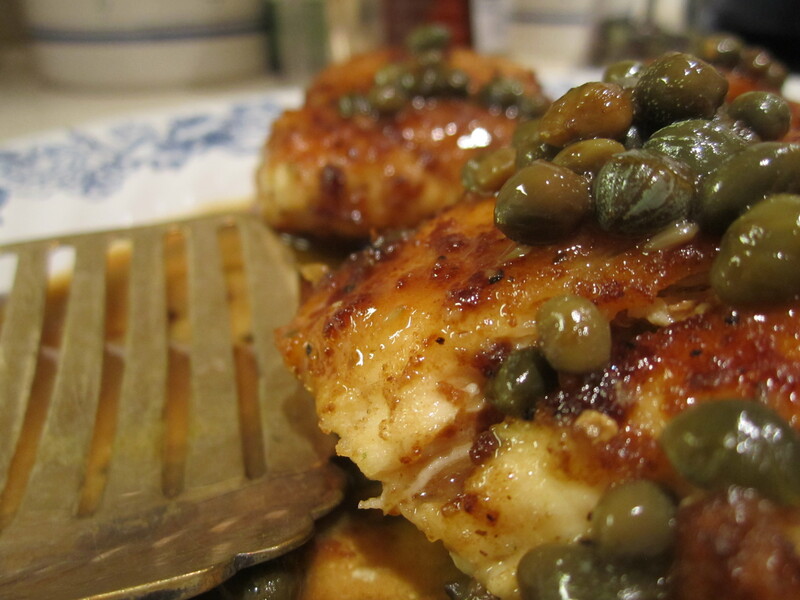 While having a casual dinner over at one such family’s house, we experienced Lemon Caper Chicken. It’s a really simple dish that doesn’t take long to make and it definitely looks fancy…and who doesn’t like looking fancy ? 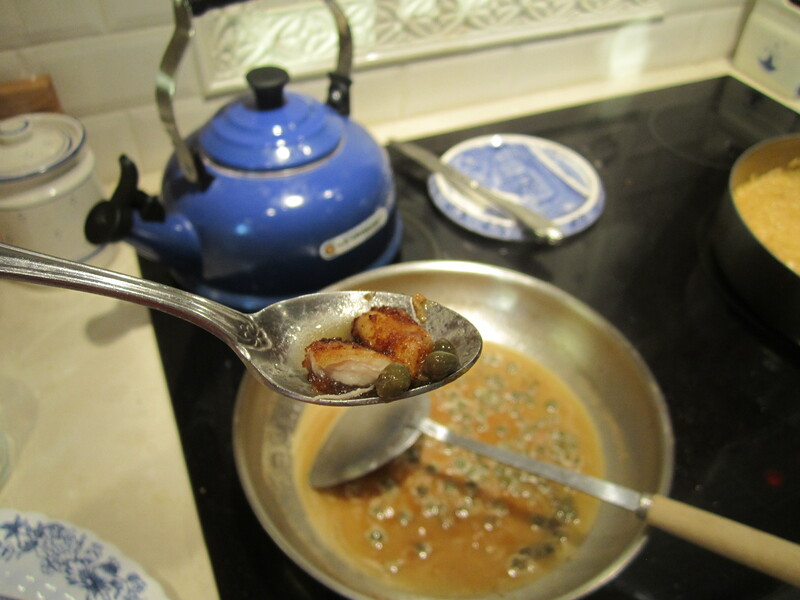 The bite from the lemon and the white wine work well with the sourness (and surprise) of the capers. This recipe will make enough to feed 4 people. OPTIONAL FIRST STEP : Pound the chicken between two pieces of plastic wrap to flatter/tenderize. 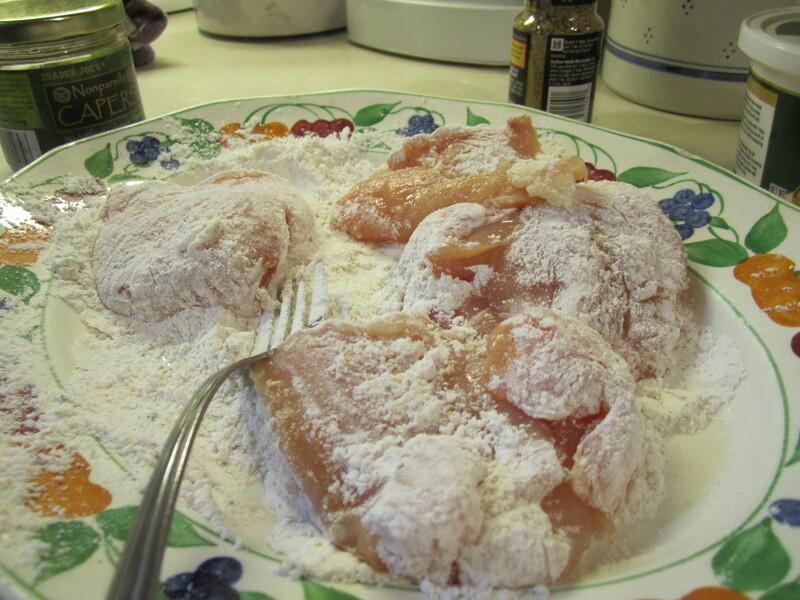 Place the pieces of chicken into a bowl of flour that has been seasoned with a little salt and pepper. In a large skillet, heat the olive oil over medium heat until hot (but not smoking! We don’t want the fire alarm to go off…). Add the chicken and cook for about 10 minutes or until browned and cooked through. Be sure to flip the chicken after about 5 minutes. I always have to cut the chicken in half to make sure it’s no longer pink on the inside – chicken is tricky and you don’t want to risk having not entirely cooked the meat. When done, remove the chicken from the pan and place it on a platter. Cover to keep warm. Add the wine and lemon juice to the pan and scrape the bottom to remove the brown bits – these will add great flavor to the dish. When you add an acid to the pan, you are deglazing it – dissolving so to speak those bits of delicious protein that stuck to the bottom of the pan. Bring this mixture to a boil and add the capers. Let simmer for about 2 minutes before whisking in the butter, one piece at a time. Cook over low heat for 1 minutes. Pour the sauce over the chicken and serve ! This pairs well with rice, be it risotto or white rice, as a starch. A piece of homemade bread is also welcome, given that the sauce is absolutely heavenly. My family now thinks it’s WISE to leave me all by myself – dinner is [magically] made by the time they return to the house ! 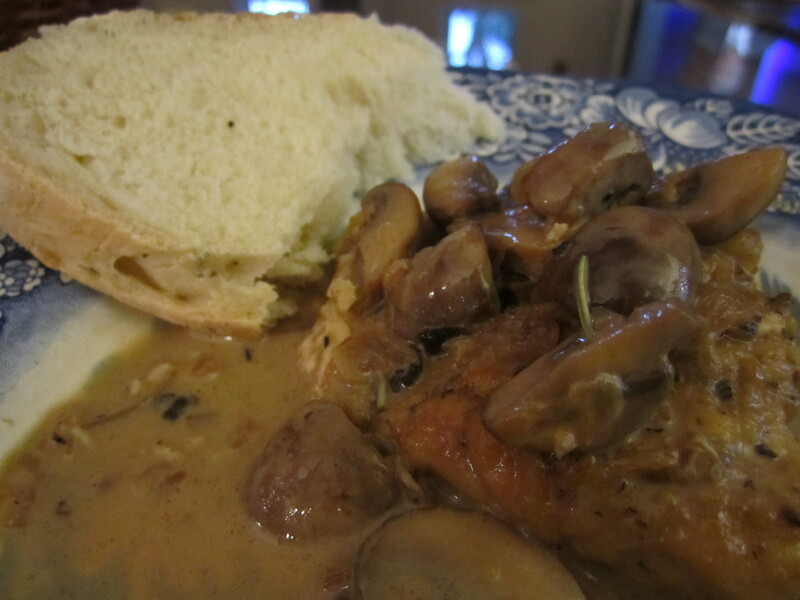 Here is the recipe, adapted from Gourmet Magazine’s Chicken Marsala. In a medium saucepan, bring the broth to a boil over high heat and let boil, uncovered, until reduced to about 1 cup of liquid. Depending on the power behind your stovetop, this can take 15-20 minutes. If it reduces too much, it’s okay – you’ll just have a little less sauce. This (OF COURSE) can be offset by adding more wine/cream later, so don’t stress. Chop the shallow/onion. I never have shallots so I’m always substituting onions. To cut an onion finely, I recommend halving it, then cutting gridlines with the knife on the half of the onion. Then, slice thinly, and the onion will fall onto the cutting board in nice small pieces. Crying is allowed. Cook the shallot/onion in 3 tbsp butter (or olive oil, that’s okay) in a large, heavy skillet over moderate heat, stirring until it begins to turn golden. At this point, add the mushrooms, being careful not to crowd them. 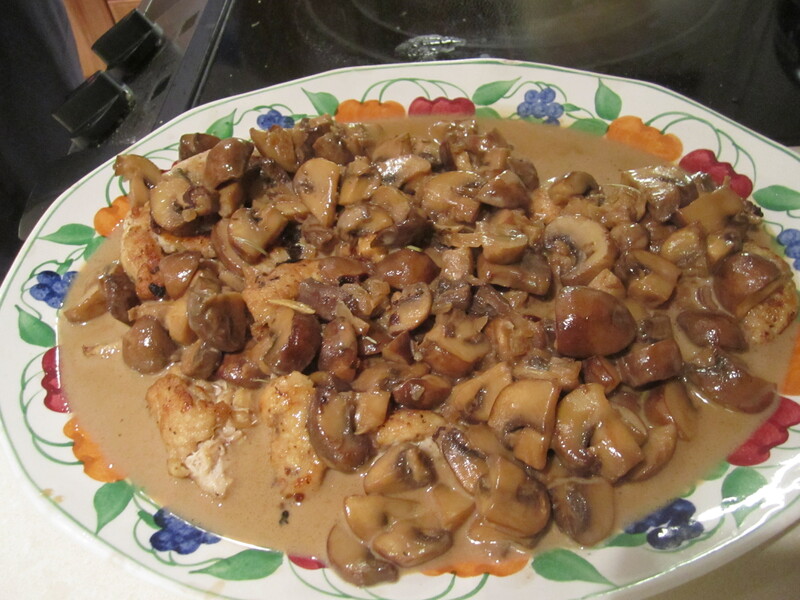 Julia Child spoke wise words when she said, “DON’T CROWD THE MUSHROOMS” as they won’t brown well if you do. Cook half the batch at a time, if necessary. Once they start to change color, I chop them in half with the wooden spatula used to stir so that they release more liquid. Season with ground black pepper and rosemary. 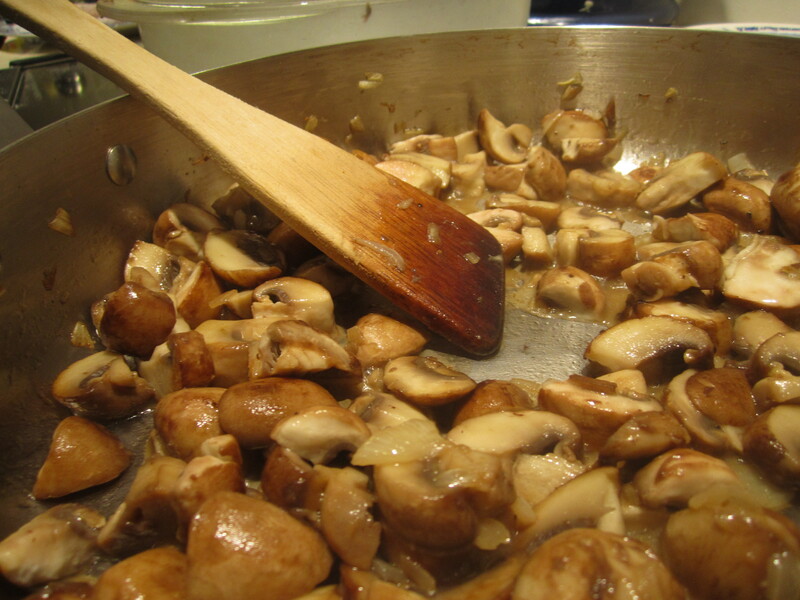 Once the liquid has been evaporated and the mushrooms are nice and brown/soft, remove from the heat and put into a bowl. Put flour in a wide, shallow bowl. Gently pound chicken to 1/4 inch thickness between two sheets of plastic wrap. 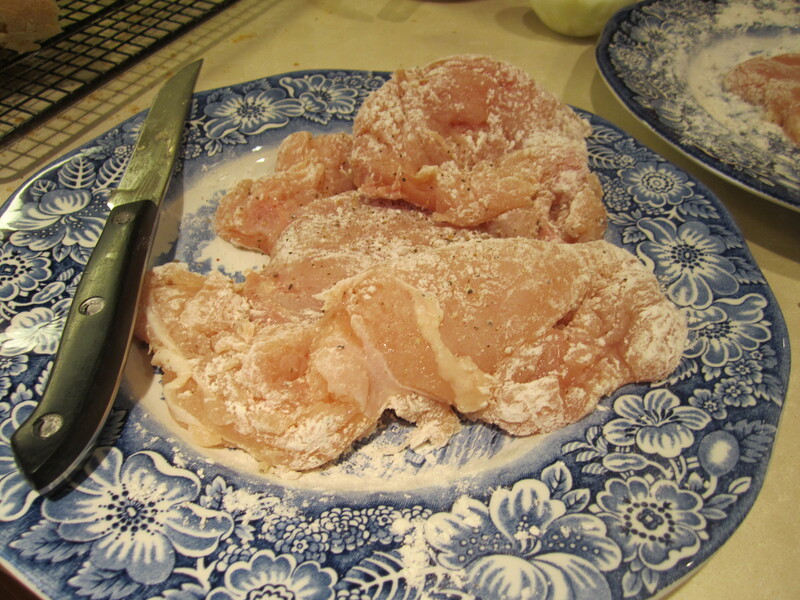 Pat the chicken dry and season with salt and pepper, then dredge in flour, one piece at a time. Using the same pan that was used for the mushrooms, heat 1 tbsp of both oil AND butter. 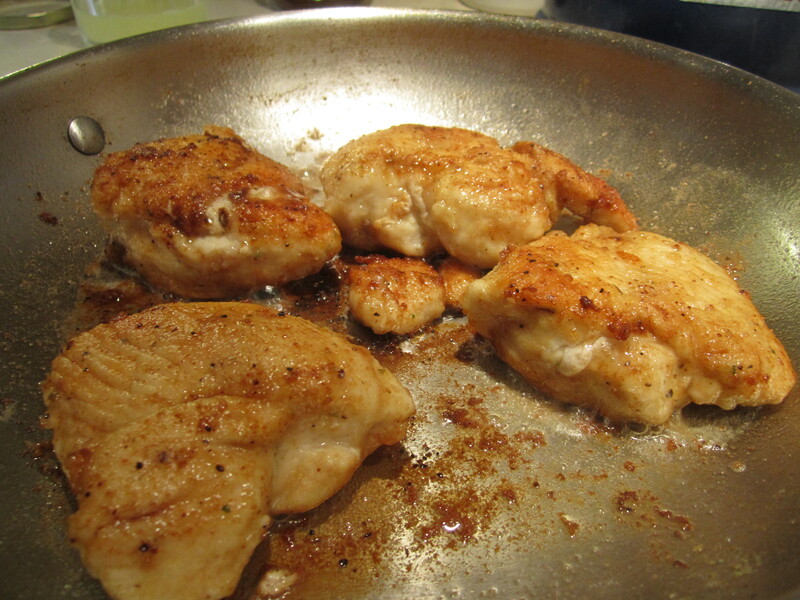 Once the butter stops frothing, place the chicken in the pan and cook until golden. Chicken takes awhile to cook and you want to make sure it is cooked ALL THE WAY THROUGH. NO PINK. Got it ? 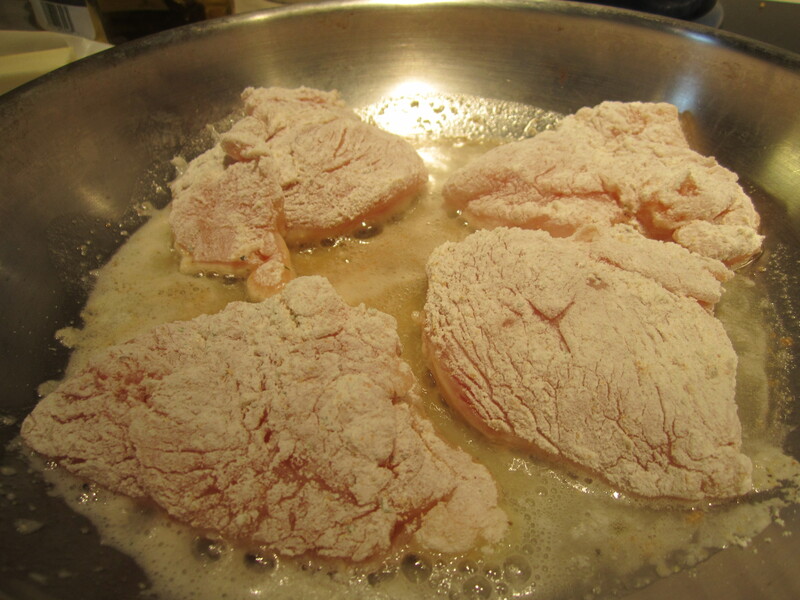 Once cooked, remove the chicken from the pan and place on a platter. To keep this warm, the chicken can be placed in the oven but WARNING – this could dry the chicken out. You know your oven – you decide. Add the wine to the skillet and boil over high heat, scraping the bottom of the pan to get all the nice brown bits leftover from the chicken. (This is called “deglazing” – it works wonderfully). 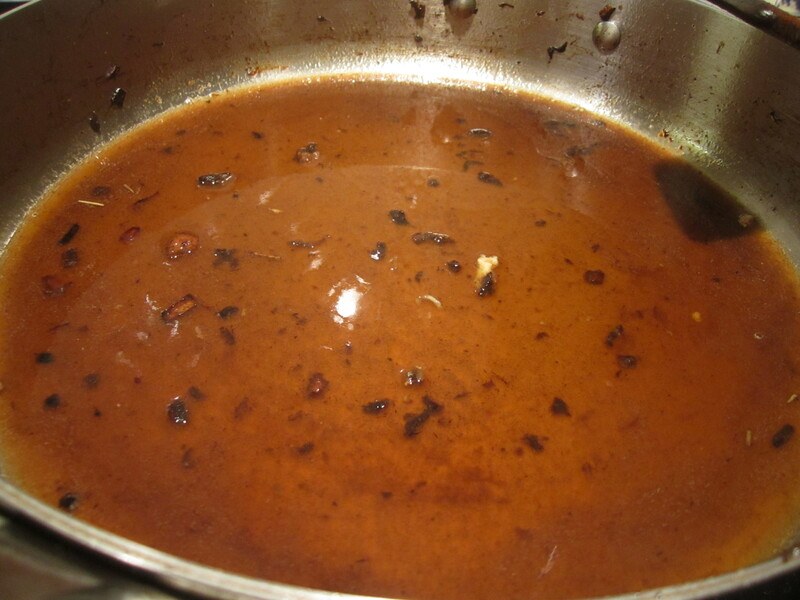 Once the sauce is hot and seasoned to your liking, add the lemon juice and a bit of wine. Stir and then pour over the chicken. Serve with a nice chunk of bread…I made mine but this dish isn’t picky – any nice, crusty Italian loaf will do. Bon appetite !